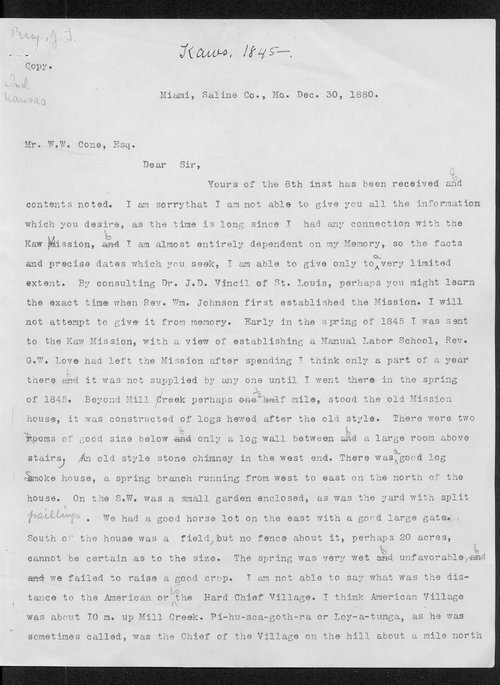 In this letter to Kansas State Historical Society clerk W.W. Cone, Reverend John Thompson Peery discusses his recollections of the Kaw Mission. According to Reverand Peery, he arrived at the Kaw Mission in the spring of 1845 to help establish a "Manual Labor School." In the letter, Peery describes the buildings on the property, as well as the Native Indian groups who lived in the vicinity of the Kaw Mission. People - Notable Kansans - Cone, W.W.
People - Notable People - Cummins, Richard W.